WiP N0 6 V:4 has a face and a title! It's a great feeling to press the 'send' button on that email that carries the final draft copy of a manuscript, delivered safe into the hands of Judi - there is a massive sense of achievement, of satisfaction, of, well, excitement! That day has come, it has arrived and all of the above feels bloody marvelous, even if I do say so myself. BUT, it gets better; Working with a cover designer for the last two weeks or so I finally have the penultimate cover - and I love it. I say 'penultimate' because there are likely to be some miniscule alterations around lighting or final font. This cover represents a big step for me, the first cover we've had professionally designed, it's an investment and everything feels so positive it's awesome. So now the whole journey of this particular book is coming to a close, or at least this stage of it's life is. 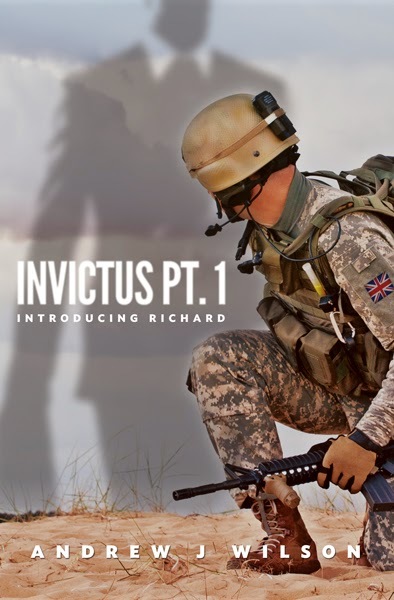 Sometime in November/December INVICTUS: Prt 1 - Introducing Richard will be published as an e-book and then it starts a new phase, released into the big bad world of books. If you were to look over the fence of 38 Bassildon Street on the outskirts of Gloucester you would witness an idyllic scene: children playing in and around the inflatable pool, the smell of the chicken and sausages smoking on the bar-B-Q hung invitingly in the air, the parents sipping iced Pimms and chatting with their visitors. It was July 1991, a glorious summers day and, to the onlooker, the scene could not be more perfect.